"Early Wakefield was known as an industrial community, linked to the city of Boston by the Boston and Maine Railroad. One of the industries that flourished in the late 1800s and into the mid 1900s was the L.B. 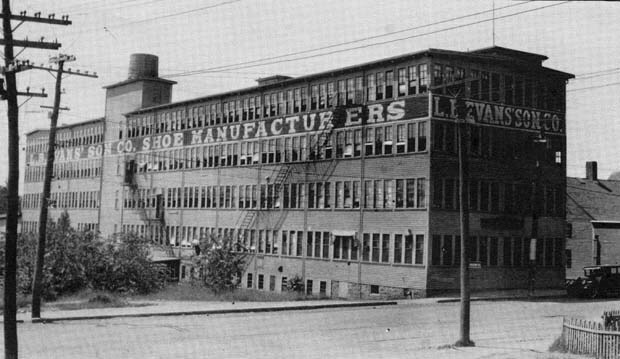 Evans Son Co. Shoe Manufacturers which was in operation until the early 1980s. The L.B. Evans Building was built in 1893, although the Evans family began making footwear in 1805 at home shops located throughout the town. The first real 'factory' was on Salem Street at the home built by Lucius Bolles Evans for his bride and was officially established in 1841. The Water Street factory built in 1893 measured 60' by 40', was three stories in height and employed 80 people. A 40' addition and a fourth story were added in 1903 with further additions made in 1911 and 1920. The company was once recognized as the oldest shoe manufacturing concern in the United States and the oldest industry in Wakefield. 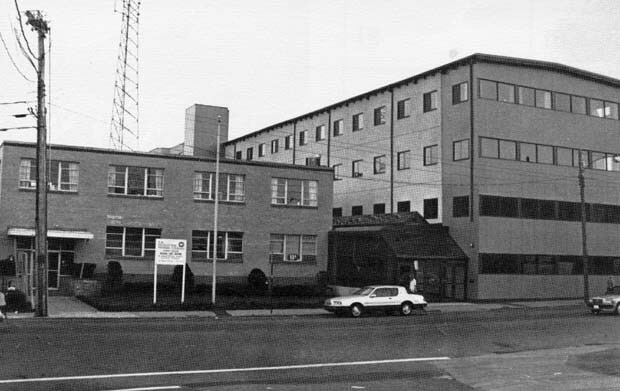 The company and its building was purchased by a Fitchburg Company in 1979 and the company slowly phased out its operation. Today the site is the home of Warner Cable Communications and the Wakefield Technology Center, an office complex with an underground garage." -- Text from calendar. ;Captions: 1. The L.B. Evans' Son Company in 1933 was employed to thousands of Wakefield and Wakefield area residents. The company manufactured a complete line of shoes and men's slippers. -- 2. The site is now an office complex and has been thoroughly modernized. Photos courtesy of the Wakefield Daily Item. “L.B. Evans,” NOBLE Digital Heritage, accessed April 22, 2019, https://digitalheritage.noblenet.org/noble/items/show/6998.